Undead Creatures consist of spirits, reanimated skeletons, and reanimated corpses. Vampires are also considered to be undead, but are undead NPCs instead of creatures. All varieties of Undead are detected using Detect Dead instead of Detect Life. Undead creatures are generally extra vulnerable to silver weapons and fire. Dragon Priests were once the primary servants of the ancient dragons of Skyrim and would rule over countless armies of men in their god's name. They are found residing in coffins in areas of prominent dragon worship, particularly Nordic ruins. If their resting place is disturbed by trespassers, the priest bursts out of its coffin (with considerably more force than a draugr's) and will proceed to attack intruders. This is a summary of information on dragon priests. See the main Dragon Priest article for more detailed information. 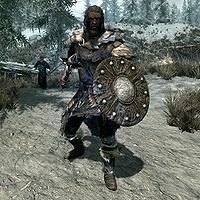 Draugr are ancient, long dead Nordic warriors who rise again in an undead state. They are mostly found in barrows and tombs, and rise from catacombs or burst out of sarcophagi to attack when you walk within their vicinity, or when certain items and events are triggered/interacted with. 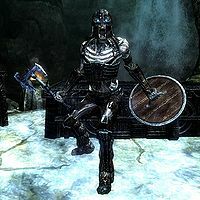 For information about dead, static corpses of draugr which can be looted, see this page. This is a summary of information on draugr. See the main Draugr article for more detailed information. 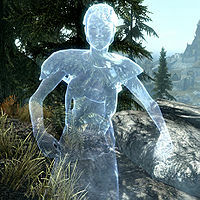 Ghosts are the incorporeal, restless spirits of the dead citizens of Skyrim. Their equipment varies and although they are usually poorly armed, they may prove to be a threat to adventurers early on due to their resistance to non-magical weaponry. Though a ghost has no physical body, it can still be affected by shouts and finishing moves, including decapitation. As they are considered NPCs, you'll need a black soul gem to trap their soul. Skeletons are the reanimated bones of the dead. They are often found with draugr in crypts and ruins, and may also be summoned by necromancers in combat. They are fully resistant to poison and paralysis and have a 25% resistance to frost, but, given their low health level and poor equipment, they are vulnerable to other types of attack, making them relatively easy opponents. This is a summary of information on skeletons. See the main Skeleton article. 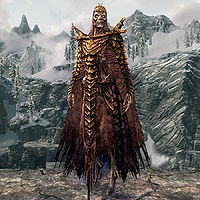 Corrupted Shade — A variety of skeleton which inhabit Meridia's Temple. They have been created by Malkoran from the casualties of the ongoing war. 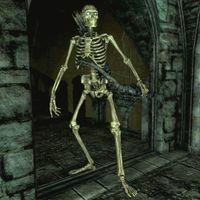 BonemanDG — A variety of skeleton archer which inhabit the Soul Cairn. You can summon them after learning Conjure Boneman from a spell tome in the Soul Cairn. MistmanDG — Floating, legless, black skeletons found in the Soul Cairn. You can summon them after learning Conjure Mistman from a spell tome in the Soul Cairn. WrathmanDG — Black skeleton warriors found in the Soul Cairn. You can summon them after learning Conjure Wrathman from a spell tome in the Soul Cairn. Zombies are creatures or NPCs that have died and been temporarily resurrected as combat allies. They are created by use of a Reanimate spell or enchantment, usually by vampires, necromancers, or even you. For more details about using zombies as allies, see this page. Plague of the Dead adds a new Zombie creature. They drop an ingredient called Mort Flesh. Zombie hordes can be encountered randomly as a world interaction or as part of the related quest, The Rising Dead. See the main Zombie article for more detailed information. This page was last modified on 24 November 2018, at 21:59.